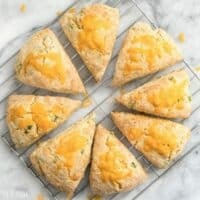 These soft, flakey Cheddar Scallion Scones are a breeze to prepare and make a great side for soups, stews, and chili! Preheat the oven to 400ºF. In a large bowl, stir together the flour, sugar, salt, baking powder, garlic powder, and some freshly cracked pepper (about 5 cranks of a pepper mill). Cut the cold butter into chunks, then add to the bowl with the flour mixture. Work the butter into the flour mixture with your hands or a pastry cutter until the texture of the flour resembles damp sand and no large chunks of butter remain. Stir the shredded cheddar and sliced green onions into the flour mixture. In a separate bowl, whisk together the milk and eggs until smooth. Pour the egg and milk mixture into the bowl with the dry ingredients. Stir until a ball of sticky dough forms and no more dry flour remains on the bottom of the bowl. Use your hands to form the dough into a cohesive ball. Turn the dough out onto a lightly floured surface and press it into an 8 inch diameter circle (about 1-inch thick). Cut the circle into 8 wedges. Place the wedges on a baking sheet lined with parchment paper and bake in the preheated 400ºF oven for about 18 minutes, or until the scones are golden brown. Serve warm or allow to cool to room temperature.